One of the most common mistakes many writers makes is to forget the readers of the book. A second mistake is to make assumptions about the knowledge level of the target audience. Both these can result in the book being rejected by the readers. When you write about a subject in which you are an expert, it is very easy to write using jargons and assuming that readers have a good understanding of the subject. This is fine in the case of books for advanced users. In all other cases, the result will be a book that no one will be willing to read. Or in other words, a wasted effort. Forgetting the readers and their level of understanding is one of the major reasons for a failed book. But it is one aspect that authors often ignore. So, let me say it once again—READER is the King. As a technical writer, you are the expert; you know the subject well; you know which areas are difficult to learn and which concepts are tough to grasp. So it is your duty as the author to simplify, illustrate and demonstrate the subject and its concepts in such a way the user will understand. If you can write in an ‘easy-to-read’ style so that the reader does not lose interest and can present the topics in an engaging manner then your readers will love your book. Some of the techniques to simplify the difficult topics and make it easy to learn is the use of examples, case studies, diagrams, illustrations, photographs, tables, graphs, quizzes, trivia, etc. If the examples given are based on your experience, they will give the book a personal touch and that is very important to connect with the readers. The real-world case studies will help the readers to understand how the concepts are applied in real life and how they help in solving real problems. Studies show that communicating visually, illustrating your message with visuals, is more than six times as effective as communicating with text alone. A single diagram, illustration, or photograph can convey what pages of text can. 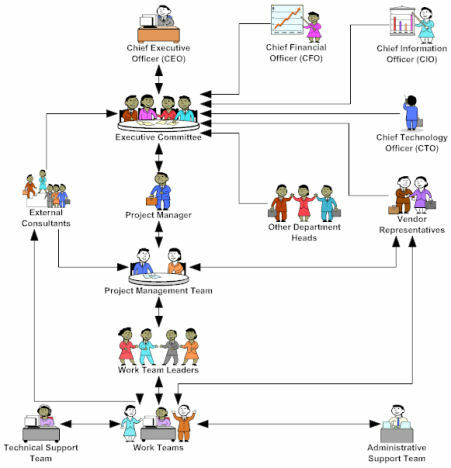 For example, the organization of an ERP implementation team is best understood if it is given as an organizational chart, rather than trying to explain it using words. So, use figures and illustrations appropriately and effectively. The photographs that are used should be apt for the situation. The figures should be neatly drawn and should be able to convey the concept clearly instead of confusing the reader. Here the author must take the help of a graphic artist, if he/she is not proficient in creating high quality sketches and clear diagrams. Tables and graphs are used to present data that is difficult to convey as text. 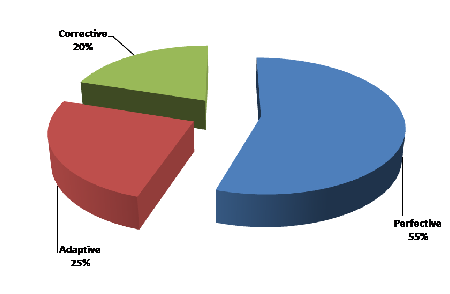 For example, the percentage of different types of software maintenance can be best expressed in the form of a Pie graph. The relationship between the cost of correcting a bug and the stage of software development where it is discovered is best illustrated using a table. Rather than writing pages of text, one can just give a single sentence—“it is better to find the bugs as early as possible as the cost of correcting the code increases as the software moves from design to production.” Then a table of the cost of of correcting a bug during the different stages of software development can be given. Quizzes, interesting facts, and tidbits can be included in the book to keep the readers involved and interested. The quizzes will also help the reader in self-evaluation. So when you are writing something the first thing you should consider is the target audience of the book—for whom the book is written. Once you identify the knowledge level of your readers—beginner, intermediate, advanced, etc.—you can decide on the writing style and the terminology that is best suited for the book. A book for beginners will be boring for an advanced reader; similarly an advanced book would be beyond the comprehension of a beginner. You can specify for whom you have written the book in the preface—Who should read this book? If you have to include the introductory and advanced topics in the same book, then try to build the concepts and fundamentals in the initial chapters and introduce the advanced topics once the readers have a working knowledge of the subject. Also you can flag the difficult topics and can advise the beginners to skip those topics. When you write a book or article with readers in mind, your writing style will change to suit the reader. The length of sentences, the choice of words will also change. The number of illustrations, photographs, and the presentation style will also vary. All these changes will go a long way in improving the usability of the book and the value it will deliver. So, when you are writing the next time, think about the readers and what they want.